I know how to buy cryptocurrency, and the verdict is still out on whether that’s good or bad. I want to share my journey with you — not as an expert by any means — but as an average person dipping a toe into the fascinating world of cryptocurrencies. Actually, I haven’t just dipped a toe. When I find myself interested in something I dive into the deep end and learn how to swim on the way up. Since my survival is at stake, it makes me a faster learner. I’ve been binge-learning anything and everything I can about blockchain technology and cryptocurrency trading. THIS IS NOT FINANCIAL ADVICE. DO YOUR OWN RESEARCH. NEVER INVEST MORE THAN YOU CAN AFFORD TO COMFORTABLY LOSE. Long story short, my Grampa tried to get me into Bitcoin around 2010 (or even earlier?). I was still working for the family business and couldn’t wrap my head around what Bitcoin could possibly be, so I brushed him off. Fast forward to now, every time I see my Grampa he updates me on the current price of Bitcoin and how we all could have been billionaires had I just honored his request. When he’d tell me, “Bitcoin is $15,000 now!”, I would still wave it off since I don’t have $15,000 to invest into anything. Well, newsflash (!!! ), you don’t have to buy a whole Bitcoin. You can own fractions of Bitcoin and any other cryptocurrencies out there. Of course, the more and more mainstream hype popping up and even emails for blog coverage requests caused me to finally look into how to buy cryptocurrencies. I might be late to the party, but the party just started (I think). My first purchase of Bitcoin was December 16, 2017. It feels like that was a year ago. This crypto space is like an alternate reality in which time no longer passes as it used to. I’ve already survived multiple “crashes.” All I can think about is crypto. All I can talk about is crypto — which is frustrating because there are few people I know IRL that do any trading — or they do, but they are way smarter than me, and I can’t keep up yet. I’ve gone from knowing nothing to owning several altcoins across multiple exchanges and participating in two ICO’s. I tell you this only to show that if you feel like you want to get involved, it’s possible to do so without a ton of money or technical know-how. I still feel like I know nothing in the grand scheme of things, but I’ve found some great resources to turn to when I need answers. 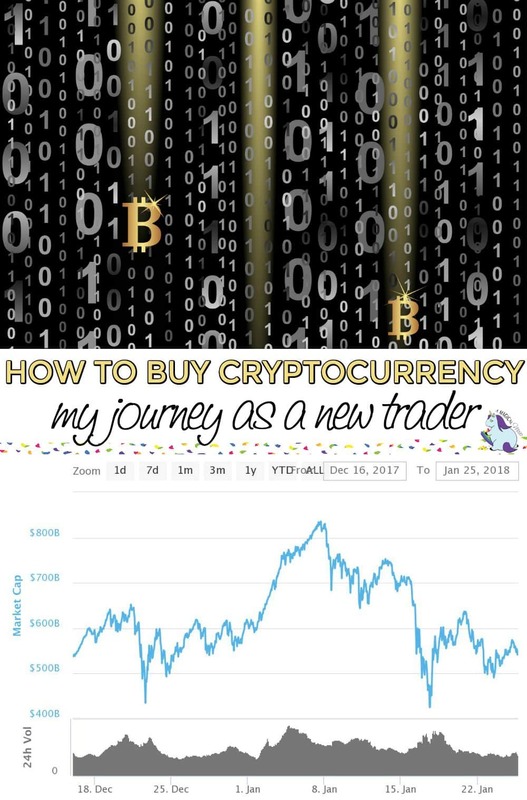 I don’t recommend diving into cryptocurrency trading as I did. In fact, my lack of patience caused me to buy in at all-time highs. (I’m still HODLing, so I’ve lost nothing) I now see how volatile the market is and if you are patient, there is quite often a dip where it’s smarter to hop in. Of course, dips and ATH’s are only seen clearly in hindsight. Absolutely no one knows for sure what will happen in this market. It could go to the moon or crash to zero. The more I learn about the tech behind the market, the more I have faith the latter won’t happen — at least not anytime soon. With more mainstream attention and looming regulations, the market remains a rollercoaster. Excitement about cryptocurrencies isn’t completely out of left field for me as I’ve always been interested in investing and learning about new technology. However, the stock market bores me to tears. It’s not something I find myself excited to write about — except for the Acorns app — I like the effortlessness of investing your “loose change.” But, the projects sprouting up in this space have me wowed daily. Cleary, I can ramble about this for days. Let’s reel this in a bit and talk about how to buy cryptocurrency should you choose to. You have to do your own research and make a decision with yourself before you choose to put any of your hard earned cash into this market. You can toss $100 or less into Bitcoin and ignore it for a year. Consider it a gamble as many people do. Or, educate yourself as much as you can to decide what you believe. No matter what route you take, use your “fun money” and take responsibility for your actions. This is money you’d take to Vegas, money you’d spend on a salon visit, or skip a few weeks of Starbucks. I’ll provide more tips I use to keep myself in check in my next post on how to buy alternative cryptocurrencies (altcoins). For now, here’s how to buy Bitcoin and a few others. Keep in mind that many exchanges close signups due to the flood of new people trying to get in. If that’s the case, just check back. The sites are all playing catchup, trying to improve their platforms for the influx of new users. Honestly, with the nature of this market as a whole, everything can change from the time I am writing this to when you read it. ==> I used Coinbase for our first purchase. (That’s our referral link — if you use it and invest $100, you will get a $10 bonus in Bitcoin and so will we.) That’s how we got our USD (fiat) into the market. At the time I signed up, it didn’t take long to get approved. I had to send in a picture of the back and front of my driver’s license and verify my bank account. The process didn’t take more than a day. From what I hear, that has changed due to the rise of new users. I was able to buy Bitcoin with a credit card fast after signup. That’s horrifying — if you aren’t super responsible with your credit cards — don’t buy Bitcoin with a credit card! Transfer funds from your bank electronically which takes about 3-5 days as another option. You can lock in the price using bank transfer — you just won’t have access to the coins until the funds clear. *** Note: Coinbase is a broker. Their exchange is GDAX. (It’s easy to signup and link accounts once your Coinbase account is ready.) Use Coinbase to get your money into the market. Should you choose to trade, use GDAX to save on fees. Coinbase is also not a wallet. Should you choose to buy and hold coins, please look into wallet options. A Coinbase alternative that I know of is Gemini. (Not a referral link) I joined, and it took over a week to get verified. Their only option for me to send funds is a wire transfer from my bank. I haven’t done that since the transfer option is much easier with Coinbase. *** BREAKING: I just read that the Robinhood app plans to add BTC and ETH trading with zero fees in February! There are other ways to buy Bitcoin that I haven’t tried. I only feel comfortable mentioning what I have personally used, so Google other options should you need to. It’s crucial to turn on 2FA (2-factor authentication) on every single website you use. This extra step in security is there to protect you.